"I've Got a Feeling" is a 50-50 collaboration by Lennon and McCartney. The pertinent Beatles fact here is that this is only the case because the song splices together two song fragments that Lennon and McCartney were working on. Lennon wrote the middle section of the song ("Everybody had a ..."), which seemed to mesh perfectly with McCartney's "I've Got a Feeling." The song was recorded on January 22, 24, 27, and 28, 1969 and performed live on the rooftop at Saville Row on January 30, 1969. 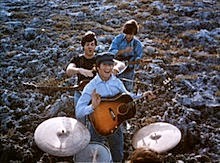 It is performed in Let It Be, and John is seen singing a few brief lines of his middle section while playing an acoustic guitar in Imagine. Lennon and McCartney share lead vocals because of the song's structure. Lennon plays lead guitar, Harrison rhythm, McCartney bass, Starr drums, and Billy Preston organ.